To the arches and beyond. 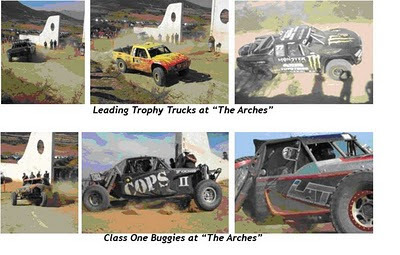 "Weatherman" is as much a part of the Baja race as anyone else. Bob Steinberger was originally a Ham radio operator who in 1975, set up antennas from three weather balloons on top of a mountain near the El Diablo top, and has now become the eyes and ears of the Baja 1000, handling and directing all communication. Our first stop was at the "Arches," approximate to Km19. We weren’t alone, and before long, many people had joined us to get a first glimpse of the trophy trucks and Class One buggies that would lead off the race. The first indication that cars were on their way was the sight and sound of the chase helicopters. These were the domain of the professional teams; while not actually allowed to provide direct assistance, they could certainly coordinate recovery operations. The cars leave at 30-second intervals, and by the time the first trucks reached us, that gap was pretty static. Aside from the speed and sound of the cars, the most impressive thing was the amount of dust that was thrown up! For next 30 or so hours, that was what we would be living with and crunching between our teeth! It was soon time for us to move on and meet up with our other support crew at Km33 and there, we had our first "racing incident." Chase 4 was hit by Chase 2 ….oops…. Apparently, the clutch on the Toyota was worn. That, or the driver just messed it up! Either way, there was a crunch and the bonnet was folded in two. Amazingly, with some slight amount of persuasion, the bonnet closed and just a minor dent remained. An appropriately placed "Honda Racing/HPD" sticker covered much of the damage! Oh well, the truck was headed to the crusher when it got back. A little war wound wouldn’t hurt….